The first Presentation Sisters arrived in Madras on the 13th January, 1842 and began their dedicated service in the city. The first foundation of the Presentation Sisters was laid at George Town, where the nuns were involved in educating both Indian and European girls. This foundation was established by the widow of an English Officer, Colonel Smith. After the death of her husband, Mrs. Smith led a very pious life looking after the orphans of the Catholic Soldiers. In 1810, Mrs. Smith started a regular school for the orphans, which was none other than St. Ursula's that was formally known as St. Mary's Orphanage School, George Town. During World War II, our school was shifted to Theni for fear of the city being burnt. After the war was over, the school was again set up in Madras. Our school along with the boarding was functioning in George Town till 1946. In 1947, the school had to be shifted to Church Park campus to make room for the Catholic Centre at Armenian Street, George Town. 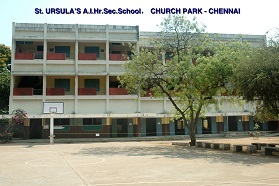 The school then came to be known as St. Ursula's European and Anglo-Indian Middle School. Mother Basil was in charge of the boarding for the Anglo-Indian girls. Later on Sr. Joan Ryan took over the school as Headmistress for many years and rendered her selfless service following in the footsteps of Nano Nagle. In 1963, our school was recognized as St. Ursula's Anglo-Indian High School and in 1978, it was upgraded to a Higher Secondary School. Now St. Ursula’s has more than 1600 girls on its roll and continues to strive towards excellence in Academics, Sports and in every sphere, upholding the ideals of its founder, Venerable Nano Nagle. St. Ursula's owes a great deal of gratitude to stalwarts like Mother Basil, Sr. Elaine and Sr. Joan Ryan who were the pioneers of Ursuline education. We also acknowledge and sincerely appreciate the efforts of all the Presentation sisters, Correspondents and Principals through the years- Sr. Rosemary, Sr. Leela, Sr. Marian, Sr. Josie, Sr. Gracy, Ms. Shobha Souriar and at present Sr. Prabha, for their significant contribution for the welfare and progress of St. Ursula's.